"9mm" redirects here. For other cartridges with 9 mm bullets, see 9 mm caliber. For other uses, see 9mm (disambiguation) and Parabellum (disambiguation). The 9×19mm Parabellum is a firearms cartridge that was designed by Georg Luger and introduced in 1902 by the German weapons manufacturer Deutsche Waffen und Munitionsfabriken (DWM) (German Weapons and Munitions Factory) for their Luger semi-automatic pistol. For this reason, it is designated as the 9mm Luger by the Sporting Arms and Ammunition Manufacturers' Institute (SAAMI), and the 9 mm Luger by the Commission Internationale Permanente pour l'Epreuve des Armes à Feu Portatives (CIP). The name Parabellum is derived from the Latin: Si vis pacem, para bellum ("If you seek peace, prepare for war"), which was the motto of DWM. Under STANAG 4090, it is a standard cartridge for NATO forces as well as many non-NATO countries. According to the 2014 edition of Cartridges of the World, the 9×19mm Parabellum is "the world's most popular and widely used military handgun and submachine gun cartridge." In addition to being used by over 60% of police in the U.S., Newsweek credits 9×19mm Parabellum pistol sales with making semiautomatic pistols more popular than revolvers. 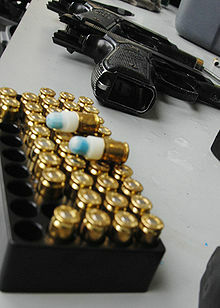 The popularity of this cartridge can be attributed to the widely held conviction that it is effective in police and self-defense use. Its low cost and wide availability contribute to the caliber's continuing popularity. Georg Luger developed the 9×19mm Parabellum cartridge from his earlier 7.65×21mm Parabellum round, which itself was derived from the original 7.65×25mm Borchardt cartridge in the Borchardt C-93 pistol. Shortening the length of the cartridge case used in the Borchardt pistol allowed him to improve the design of the toggle lock and to incorporate a smaller, angled grip. Luger's work on the Borchardt design evolved into the Luger pistol, first patented in 1898 and chambered in 7.65×21mm Parabellum. Demand from Germany for a larger caliber in their military sidearm led Luger to develop the 9×19mm Parabellum cartridge for the eventual P08 pistol. 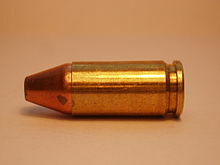 This was achieved by removing the bottleneck shape of the 7.65×21mm Parabellum case, resulting in a tapered rimless cartridge encasing a bullet that was 9 mm in diameter. In 1902, Luger presented the new round to the British Small Arms Committee, as well as three prototype versions to the U.S. Army for testing at Springfield Arsenal in mid-1903. The Imperial German Navy adopted the cartridge in 1904 and in 1908 the German Army adopted it as well. The ogive of the bullet was slightly redesigned in the 1910s to improve feeding. To conserve lead during World War II in Germany, the lead core was replaced by an iron core encased with lead. This bullet, identified by a black bullet jacket, was designated as the 08 mE (mit Eisenkern—"with iron core"). By 1944, the black jacket of the 08 mE bullet was dropped and these bullets were produced with normal copper-colored jackets. Another wartime variation was designated the 08 sE bullet and identified by its dark gray jacket, and was created by compressing iron powder at high temperature into a solid material (Sintereisen—"sintered iron"). After World War I, acceptance of the 9×19mm Parabellum cartridge increased, and 9×19mm Parabellum pistols and submachine guns were adopted by military and police users in many countries. The 9×19mm Parabellum has become the most popular caliber for U.S. law enforcement agencies, primarily due to the availability of compact pistols with large magazine capacities that use the cartridge. Worldwide, the 9×19mm Parabellum is one of the most popular pistol cartridges where it is legal (some countries ban civilian use of weapons that chamber current or former military service cartridges), and cartridges in this caliber are generally available anywhere pistol ammunition is sold. From the early 1980s to the mid-1990s, a sharp increase occurred in the popularity of semiautomatic pistols in the U.S., a trend foreshadowed by the adoption of the Smith & Wesson Model 39 by the Illinois State Police in 1968. In addition, the Beretta M9 (a military version of the Beretta Model 92) was adopted by the U.S. Army in 1985. Previously, most American police departments issued .38 Special caliber revolvers with a six-shot capacity. The .38 Special was preferred to other weapons such as variants of the M1911 because it offered low recoil, was small and light enough to accommodate different shooters, and was relatively inexpensive. The 9mm cartridge is ballistically superior to the .38 Special revolver cartridge, is shorter overall, and being an autoloader cartridge, it is stored in flat magazines, as opposed to cylindrical speedloaders. This, coupled with the advent of the so-called "wonder nines", led to many U.S. police departments exchanging their revolvers for some form of 9mm semiautomatic handguns by the 1980s. In 2013 a chart of popular calibers that was released by the website Luckygunner.com showed 9mm x 19mm Parabellum as having 21.4% of the entire cartridge market followed by the .223 Rem at 10.2% (with 5.56mm included this is 15.7%). The next most popular caliber was .45 ACP. With selecting the SIG Sauer P320 as the winner of the XM17 Modular Handgun System competition, the United States Army and United States Air Force chose the 9×19mm again as the cartridge for their new service pistol. The 9×19mm Parabellum has 0.86 ml (13.3 grains H2O) of cartridge case capacity. 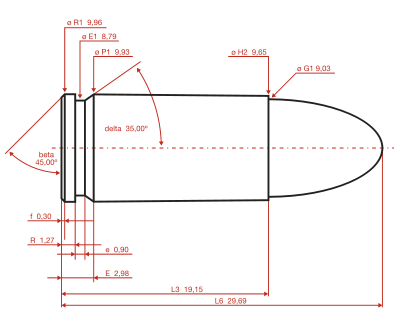 9×19mm Parabellum maximum CIP cartridge dimensions: All sizes are given in millimeters (mm). The cartridge headspaces on the mouth of the case: The common rifling twist rate for this cartridge is 250 mm (1 in 9.84 in), six grooves, ø lands = 8.82 mm, ø grooves = 9.02 mm, land width = 2.49 mm and the primer type is small pistol. According to CIP rulings, the 9×19mm Parabellum cartridge case can handle up to 235.00 MPa (34,084 psi) Pmax piezo pressure. In CIP-regulated countries every pistol cartridge combination has to be proofed at 130% of this maximum CIP pressure to certify for sale to consumers. This means that 9×19mm Parabellum chambered arms in CIP regulated countries are currently (2014) proof tested at 305.50 MPa (44,309 psi) PE piezo pressure. The SAAMI pressure limit for the 9×19mm Parabellum is set at 241.32 MPa (35,001 psi) piezo pressure. The SAAMI pressure limit for the 9×19mm Parabellum +P is set at 265.45 MPa (38,500 psi) piezo pressure. An empty case with primer weighs about 4 g (0.14 oz). The round was originally designed to be lethal to 50 meters, but is still lethal at longer ranges. The 9mm cartridge combines a flat trajectory with moderate recoil. According to the 1986 book Handloading: "the modern science of wound ballistics has established beyond reasonable doubt that the 9mm cartridge is highly effective." In 2014, the United States Federal Bureau of Investigation (FBI) released a report detailing the potential combat effectiveness of the 9mm cartridge when compared to other calibers such as the .45 ACP and the .40 S&W cartridge that was specifically developed for use by the FBI. The report indicated that the new powders and more advanced bullet designs used in current 9mm defensive loads allowed for the caliber to deliver almost similar performance to other calibers, like the .45 ACP, and .40 S&W. In addition to this, the lower recoil, less wear, cheaper ammunition and higher capacity were all reasons that the report cited for the recent surge in orders of the ammunition from various police agencies. With a wider selection of officers being able to shoot handguns chambered in 9×19mm, many departments choose this caliber so they can standardize around a single firearm and loading, making logistics and supply easier. Due to all of these factors, law enforcement orders of 9mm ammo from all major ammunition manufacturers have spiked significantly. The FBI report made it clear that the more consistent accuracy of 9mm in the hands of their less experienced shooters was a factor in their returning to 9mm as their standard handgun caliber. It was also made clear that the almost same effectiveness of 9mm compared to .40 S&W and .45 ACP was due to the high quality of 9mm ammunition available. In addition to the traditional pressure values for this cartridge, two main variants offer different pressure standards than the SAAMI or CIP requirements. The Cartridge S.A. Ball 9 m/m Mark Iz (9 m/m BALL MK 1z) was the standard Imperial 9mm Parabellum round in World War II and was produced from December 1941 to 1944. It was meant for use in semiautomatic pistols like the Inglis Browning Hi-Power. Bullet weight was 115 grains (7.5 g). Velocity was 1,200 feet per second (370 m/s) at 20 yards (18 m). It is noted by its purple annulus around a standard gold-colored primer. The higher-powered Cartridge S.A. Ball 9 m/m Mark IIz (9m/m Ball MK 2z) was in production from September 1943 until 1988, and was graded as NATO standard in 1962. It was designed for use in submachine guns such as the Lanchester, Sten, and Sterling. Bullet weight is 115 grains (7.5 g) over a charge of 6 grains (0.39 g) of Du Pont SR.4898 or Dynamit-Nobel Parabellum Powder. Velocity is 1,300 feet per second (400 m/s) at 20 yards (18 m). It can be distinguished from the 9-mm Ball MK 1z by its purple annulus around a silver primer. India and Pakistan manufactured 9mm Parabellum ammunition to this standard after independence. Canada's Cartridge S.A. Ball 9 m/m CDN Mark I (9-mm Ball CDN MK 1), made since 1955, has similar ballistics. Bullet weight is 115 grains (7.5 g). Nominal muzzle velocity is 1,246.7 feet per second (380.0 m/s). The cartridge has been manufactured by, or for, more than 70 different countries and has become a standard pistol caliber for NATO and other military forces around the world. Its official nomenclature among NATO members is "9 mm NATO". Standard bullet weight is 7.0 grams (108 gr) to 8.3 grams (128 gr). 9 mm NATO can be considered an overpressure variant of the 9×19mm Parabellum that is defined by NATO standards. The service pressure Pmax of the 9 mm NATO is rated at 252 MPa (36,500 psi) where CIP rates the 9mm Luger Pmax somewhat lower at 235 MPa (34,100 psi). The 315 MPa (45,700 psi) proofing test pressure used in the NATO 9mm proof test, however, equals the proofing test pressure used in the 9mm Luger CIP proof test. While the NATO standards do not specify the type of bullet to be used, Declaration III of the Hague Convention of 1899 prohibits the use of expanding ammunition in warfare by signatories, so official NATO 9mm ammunition is FMJ "ball" bullets. Declaration III does not apply in conflicts involving nonsignatories to the Hague Convention, including paramilitary and other nongovernmental fighting forces. 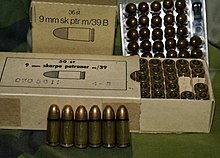 9mm Parabellum entered Swedish service as m/39 with the import of the Kulsprutepistol m/39 from Austria, with a bullet weight of 7.5 grams (116 gr). During the Congo Crisis, the Swedish UN-contingent issued complaints about the performance of the m/39 cartridge (regular 9mm Parabellum) used, which resulted in a commission of the Swedish Army establishing in 1962 that a new round was needed for the Carl Gustav m/45. The resulting m/39B had a tombac-plated steel jacket surrounding the lead core. While the lands of the barrel can cut into the tombac, the steel jacket resists deformation, thus causes the gas pressure to rise higher than the previous soft-jacketed m/39, giving the 7.0 grams (108 gr) bullet a Vₒ of 420 m/s (1,378 ft/s) and an impact energy of 600 joules. The mantle also acts like a penetrator when striking a target, going through up to 50 layers of kevlar, 7 cm bricks or 25 cm of wood, allowing the bullet to defeat body armour up to Type IIIA. The downside is the higher wear on the weapon, ultimately causing the service pistol m/40 to be withdrawn from service. The m/39 is also available as a "gallery round" – kammarpatron m/39 – black with blue tip, for indoor gallery shooting, and as a blank round – lös patron m/39 – which has the metal bullet replaced with one in red, hard plastic intended to disintegrate into dust when fired. Attempts to improve ballistics of the cartridge came in the early 1990s with the widespread availability of high-pressure loadings of the 9mm cartridge. Such overpressure cartridges are labeled "+P" or, in the case of very high pressure loadings, "+P+". Ballistic performance of these rounds was moderately improved over the standard loadings. In addition, improvements in jacketed hollow-point bullet technology have produced bullet designs that are more likely to expand and less likely to fragment than earlier iterations, giving a 9mm bullet better terminal effectiveness. 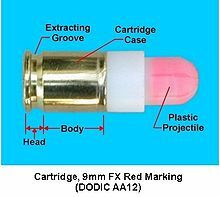 The United States Military uses red and blue marking rounds in the 9mm caliber known as Special Effects Small Arms Marking Systems (SESAMS). Commonly used for training simulations, these rounds are comparable in function to the paintballs used in paintball markers, except they are fired with a powder charge, and can be shot in Beretta M9 service pistols with only a barrel modification (The Glock 19 pistol, common among police departments, has a similar available modification). The 9mm SESAMS rounds are fired from specially modified pistols, as well as M16 and M4 rifles, which are incapable of chambering standard live ammunition. SESAMS weapons or components are normally painted blue or otherwise clearly marked, to denote their inert status and avoid a potentially catastrophic mixup with live-fire weapons. This allows the armed forces to train with nearly identical equipment as used in real-life situations. The brand name for this ammunition, which is sold commercially and to law enforcement, is Simunition. The Russian military has developed specialized 9×19mm cartridges that use relatively light bullets at high muzzle velocities for both pistols and submachine guns to defeat body armour. Besides enhanced penetration capabilities, these overpressure variants offer a flatter trajectory and lessened recoil. The increase in service pressure causes a rise in bolt thrust, so the use of this overpressure ammunition induces more stress on critical weapon parts during firing. After initial research, conducted since the late 1980s under the codename "Grach", the Russian armed forces adopted two specialized 9×19mm variants. R50 at 25 m (27 yd) means the closest 50 percent of the shot group will all be within a circle of 25 mm (1.0 in) radius at 25 m (27 yd). The 7N21 (Cyrillic: 7Н21) 9×19mm overpressure variant features an armour-piercing bullet and generates a peak pressure of 280 MPa (41,000 psi). The 7N21 bullet features a hardened (subcaliber) steel penetrator core, enclosed by a bimetal jacket. The space between the core and jacket is filled with polyethylene, and the tip of the penetrator is exposed at the front of the bullet, to achieve better penetration. The penetration range for body armor is specified at up to 40 m. The MP-443 Grach and GSh-18 pistols and PP-19-01, PP-90M1 and PP-2000 submachine guns were designed for use with this overpressure cartridge. Jane's Infantry Weapons stated in 2003 that the 7N21 cartridge combines the 9×19mm Parabellum dimensions with a 9×21 mm Gyurza bullet design and was developed specifically for the penetration of body armor and for the MP-443 Grach pistol, the latest Russian service pistol. The 7N31 (Cyrillic: 7Н31) / PBP 9×19mm overpressure variant uses the same concept with a similar but lighter bullet that achieves higher muzzle velocity. The penetration of an 8 mm-thick steel plate is specified at up to 10 m. The 7N31 cartridge was developed in the late 1990s for the GSh-18 pistol. The 7N31 was adopted for the PP-90M1 and PP-2000 submachine guns. Its maximum service pressure remains unclear. The method of construction of the two rounds allows them to be effective against both unarmored and armored targets. If the bullet strikes an unarmored target, it holds together to produce a wide wound channel. If the bullet strikes an armored target, the sleeve is stripped away and the core penetrates alone. The disadvantage of the rounds is that high impact velocities are needed for them to work effectively, so the bullets are relatively light to maximize their muzzle velocity. This means they lose velocity relatively quickly, limiting their effective range. VBR-B produces specialized bullets for this cartridge, a two-part controlled fragmenting projectile and an armor-piercing bullet that features a brass sabot and a hardened steel penetrator. These are designed for increasing the content of the permanent wound cavity and double the chance to hit a vital organ. The energy delivered by most 9mm loads allows for significant expansion and penetration with premium hollow-point bullets. Illinois State Police, Border Patrol, Federal Air Marshals, and United States Secret Service favored and used 115 gr (7.5 g) +P+ 9mm loads at 1,300 ft/s (400 m/s) for years with excellent results. Massad Ayoob has stated that the "Tried, Tested, and True" 115 gr (7.5 g) +P or +P+ is the best self-defense load in this caliber. Proponents of the hydrostatic shock theory contend that the energy of the 9mm cartridge is capable of imparting remote wounding effects known as hydrostatic shock, in human-sized living targets. The table below shows common performance parameters for several 9×19mm loads. Bullet weights ranging from 115 to 147 gr (7.5 to 9.5 g) are common. Loads are available with energies from just over 400 J (300 ft⋅lb) to 680 J (500 ft⋅lb), and penetration depths from 200 mm (8 in) to over 1.0 m (40 in) are available for various applications and risk assessments. ATOMIC Ammo JHP+P 8.0 g (124 gr) 400 m/s (1,300 ft/s) 630 J (465 ft⋅lb) 15 mm (0.60 in) 330 mm (13 in) "N/A" "N/A"
Expansion: expanded bullet diameter (ballistic gelatin). Penetration: penetration depth (ballistic gelatin). PC: permanent cavity volume (ballistic gelatin, FBI method). TSC: temporary stretch cavity volume (ballistic gelatin). ^ "Sellier & Bellot". Retrieved 23 March 2009. ^ "Buffalo Bore". Retrieved 23 March 2009. ^ a b c d "CIP TDCC sheet 9 mm Luger" (PDF). ^ "Cartridge and Chamber Drawing" (PDF). saami.org. Retrieved 7 October 2017. ^ Sweeney, Patrick (17 November 2009). Gun Digest Big Fat Book of the .45 ACP. Gun Digest Books. p. 33. ISBN 978-1-4402-0219-3. Retrieved 17 December 2011. Georg Luger looked at his design, took the .30 Luger case and expanded it to hold a 9mm bullet. ... From the Latin phrase Si vic pacem, para bellum came parabellum. Translated it means "If you desire peace, prepare for war. ^ a b STANAG No. 4090 (Edition 2) (PDF) (2 ed.). North Atlantic Treaty Organization. 15 April 1982. p. C-1. Retrieved 23 April 2016. ^ a b Barnes, Frank (2006). Skinner, Stan, ed. Cartridges of the World. 11th Edition. Cartridges of the World. Gun Digest Books. p. 295. ISBN 978-0-89689-297-2. ^ Barnes, Frank C (2014). Cartridges of the World (14th ed.). Iola, WI, USA: Krause Publications. pp. 446–447. ISBN 9781440242656. ^ Dunlap, Roy (1948). Ordnance went up front: some observations and experiences of a sergeant of Ordnance, who served throughout World War II with the United States Army in Egypt, the Philippines and Japan, including way stations. Small-Arms Technical Pub. Co. pp. 43–45. ^ Shideler, Dan (2010). "The Luger Pistol". The Greatest Guns of Gun Digest. Krause Publications. p. 24. ISBN 978-1-4402-1414-1. ^ CCI/Speer Inc. (2007). Reloading Manual #14. ISBN 978-0-9791860-0-4. ^ a b Clede, Bill (1985). Police Handgun Manual: How to Get Street-Smart Survival Habits. Stackpole Books. pp. 116–118. ISBN 978-0-8117-1275-0. ^ "Ballistics by the inch". Archived from the original on 21 April 2011. Retrieved 12 April 2011. ^ "Ammo in 2013: A Look Behind the Scenes at Lucky Gunner". luckygunner.com. Retrieved 2 February 2017. ^ Wilson, R. K. Textbook of Automatic Pistols, p.239. Plantersville, SC: Small Arms Technical Publishing Company, 1943. ^ "SAAMI Pressures". Archived from the original on 14 October 2007. Retrieved 29 November 2007. ^ "How Far Will a 9mm Kill?". YouTube. Retrieved 14 November 2014. ^ "FBI 9MM Justification, FBI Training Division". 25 September 2014. Retrieved 22 October 2017. ^ "How the FBI reignited the pistol caliber war". Retrieved 2015-09-14. ^ "FBI 9MM Justification, FBI Training Division". soldiersystems.net. soldiersystems.net. Retrieved 2 February 2017. ^ "Proof of Ordnance, Munitions, Armour and Explosives, Ministry of Defence Defence Standard 05–101 Part 1" (PDF). Archived from the original (PDF) on 6 April 2008. Retrieved 14 November 2014. ^ "Sniper Use of Open-Tip Ammunition". Archived from the original on 27 April 2007. Retrieved 14 November 2014. ^ "Declaration on the Use of Bullets Which Expand or Flatten Easily in the Human Body; July 29, 1899". avalon.law.yale.edu. ^ "Hemvärnet 1940–1990, 1990. Red. Bo Kjellander s. 259–260. ^ "What is +P and +P+ ammunition?". Retrieved 14 November 2014. ^ a b c Ayoob, Massad (2002). The Gun Digest Book of Combat Handgunnery (5 ed.). Iola, Wisconsin: Krause Publications. p. 26. ISBN 978-0-87349-485-4. ^ Bianco, Lance Cpl. Michael A. "Marines conduct urban warfare training". 31stmeu.marines.mil. Retrieved 26 February 2017. ^ "Commando Warrior adds realistic combat training with simunitions". andersen.af.mil. Retrieved 26 February 2017. ^ "Rosoboronexport - Land Forces Weapons Catalogue". scribd.com. Rosoboronexport. 2003. p. 108. Retrieved 3 February 2017. ^ a b Popenker, Maxim (2005–2008). "Special purpose small arms ammunition of USSR and Russia". Modern Firearms. World Guns. Archived from the original on 9 October 2012. ^ "9x19 Russian pistol cartridges". Retrieved 14 November 2014. ^ "9 × 19 mm 7N21 – Jane's Infantry Weapons". Jane's Information Group. 14 August 2003. Retrieved 16 June 2009. ^ Williams, Anthony G. "Where Next For PDWs?". quarryhs.co.uk. Retrieved 26 February 2017. ^ "VBR-B Multi-Caliber (9mm NATO/7.92x24mm) Compact PDW Pistol". defensereview.com. Retrieved 26 February 2017. ^ Courtney, Michael; Courtney, Amy (2008). "Scientific Evidence for Hydrostatic Shock". arXiv:0803.3051 [physics.med-ph]. ^ Courtney, A.; Courtney, M. (2007). "Links between traumatic brain injury and ballistic pressure waves originating in the thoracic cavity and extremities". Brain Injury. 21 (7): 657–662. arXiv:0808.1443. doi:10.1080/02699050701481571. PMID 17653939. Ballistics By The Inch 9×19mm Parabellum Results.